As concern for the welfare of species like honey bees and monarch butterflies grows alongside awareness of the impact of climate change, inspiring the next generation of citizen scientists is more important than ever. With Wildlife Ranger Action Guide, kids can make the world better for the animals and insects they love, starting right in their own backyards. Dozens of hands-on activities and habitat creation projects, such as making a frog pond from a kiddie pool, planting a pollinator garden for bees, painting a bat house, and building a lodge for lizards, encourage children to learn about and take an active role in protecting local wildlife. Lively photographic field guides covering 78 North American wildlife species teach kids about the habits and habitats of each and include tips for providing the plants and food needed for their survival. 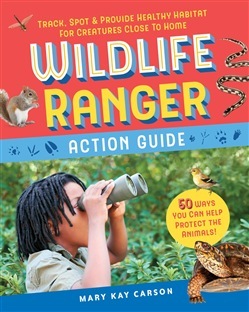 Acquista Wildlife Ranger Action Guide in Epub: dopo aver letto l’ebook Wildlife Ranger Action Guide di Mary Kay Carson ti invitiamo a lasciarci una Recensione qui sotto: sarà utile agli utenti che non abbiano ancora letto questo libro e che vogliano avere delle opinioni altrui. L’opinione su di un libro è molto soggettiva e per questo leggere eventuali recensioni negative non ci dovrà frenare dall’acquisto, anzi dovrà spingerci ad acquistare il libro in fretta per poter dire la nostra ed eventualmente smentire quanto commentato da altri, contribuendo ad arricchire più possibile i commenti e dare sempre più spunti di confronto al pubblico online.